We have a large database of Nannies that regularly work with our clients, either as Live-in or Live-out Temporary Nannies, Overseas Nannies, or Maternity Nurses. Each prospective Nanny's experience is assessed at interview and their suitability for different placements are discussed. Original ID, DBS (police check), First Aid and other Certificates are checked, and following this, childcare references are verified. OUR SELECTION & VETTING PROCEDURE IS STRICT AND ONLY 15% OF NANNIES WHO APPLY - ARE ACCEPTED. All of our Nannies are fluent english speakers, and many have additional languages. We take into account each family's requirements, including the ages or the children, dates needed, and take time and care to match them with a suitable nanny. Usually we are able to offer more than one suitable candidate. Our system is fast and efficient, we are often able to email CVs within a few hours for short notice bookings- our record is 4 minutes! As well as CVs, we provide the verified references we have, together with feedback we have received directly from families. We are happy to supply contact details of nanny referees (with their permission) to families who would like to speak to them personally, for extra peace of mind. We recommend that the prospective Temporary Nanny goes to meet the family, so that both parties are happy that they are a good "match". Part of the purpose of this is to ensure that the Nanny will be able to build up a good rapport with the children and that the parents will be confident that they will be kept happy and safe in the Nanny's care. Where this is not possible, a telephone discussion or Skype interview will be suggested. 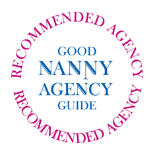 The family agree on the finer job details with the chosen Temp Nanny, and we help by providing a short temporary employment contract where necessary. Some recommended Nanny pay rates can be found on the costs page. On booking, our weekly agency fees are payable.